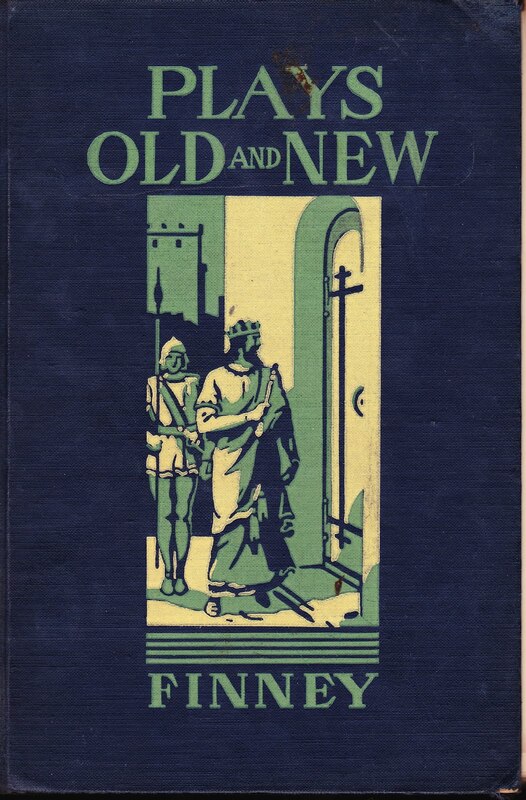 I was leafing through 1928's "Plays Old and New"1 in anticipation of sending it to its final resting place, as it has a fully detached spine and multiple loose pages. Then I came to the inside back cover, where I found some interesting graffiti for the Black Spades of the Bronx (18th division). "The gang originated in 1968 in the Bronxdale Houses in the Soundview section of the Bronx as the Savage Seven and began terrorizing the neighborhood. 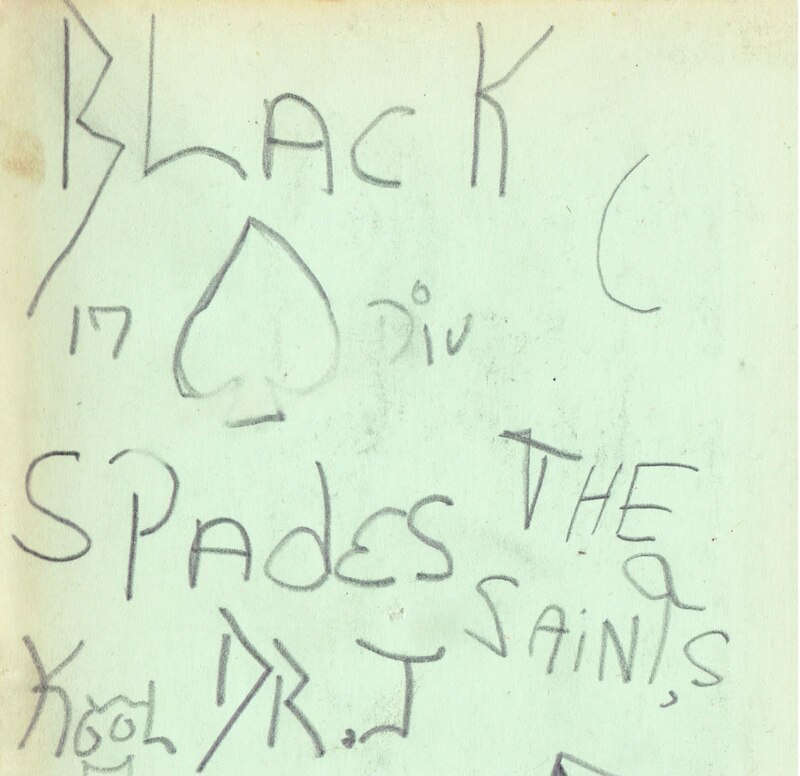 As the gang grew, they changed their name to the Black Spades. The gang quickly spread to nearby housing projects and throughout the Bronx, with divisions in almost every precinct and they had over 50 divisions in New York State alone. 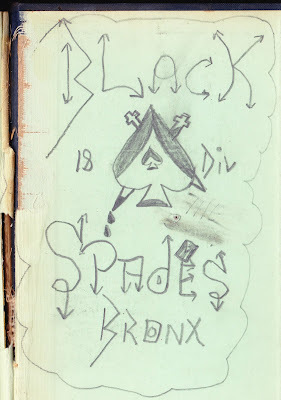 ... Afrika Bambaataa was the warlord of the Black Spades before becoming a famous hip hop DJ. 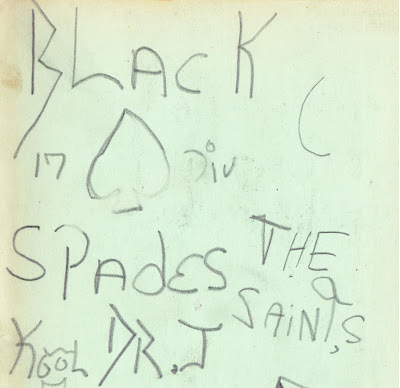 He later went on to form the Universal Zulu Nation [an international hip hop awareness group in which reformed gang members organize cultural events for youths] on November 12th, 1973; Many Black Spades gang members followed Afrika Bambaataa into the group." I'm not sure what the "The Saints" specifically refers to. It's interesting -- but not surprising -- to see "Dr. J" written on there. Julius Erving played for the ABA's New York Nets at Nassau Veterans Memorial Coliseum (on Long Island) from 1973 to 1976. 1. The book, edited by Stella B. Finney, features a dozen plays, including "The Philosopher of Butterbiggens" by Howard Chapin; "Robin Hood in Sherwood" by Alfred Noyes; "The Farce of the Worthy Master Pierre Patelin" as translated by folklorist and anarchist Moritz Jagendorf; Alice Gerstenberg's adaptation of "Alice in Wonderland"; and "The Golden Doom" by Lord Dunsany, aka Edward John Moreton Drax Plunkett, 18th Baron of Dunsany. Dunsany was one of the most important and influential fantasy authors of the early 20th century. Writers he influenced include H.P. Lovecraft, Robert E. Howard, J.R.R. Tolkien, Jorge Luis Borges and modern author Neil Gaiman. Among Dunsany's writings were more then 150 tales featuring the character of adventurer Joseph Jorkens. The Jorkens tales established the popular literary subgenre known as the club tale. Is this for sale by any chance?